Winner of the Bancroft Prize: Through a gripping narrative based on massive new research, a leading historian reshapes our understanding of the Civil War. Our standard Civil War histories tell a reassuring story of the triumph, in an inevitable conflict, of the dynamic, free-labor North over the traditional, slave-based South, vindicating the freedom principles built into the nation's foundations. But at the time, on the borderlands of Pennsylvania and Virginia, no one expected war, and no one knew how it would turn out. The one certainty was that any war between the states would be fought in their fields and streets. 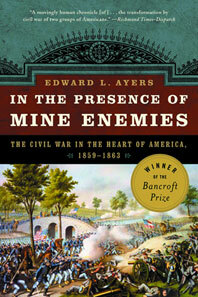 Edward L. Ayers gives us a different Civil War, built on an intimate scale. He charts the descent into war in the Great Valley spanning Pennsylvania and Virginia. Connected by strong ties of every kind, including the tendrils of slavery, the people of this borderland sought alternatives to secession and war. When none remained, they took up war with startling intensity. As this book relays with a vivid immediacy, it came to their doorsteps in hunger, disease, and measureless death. Ayers's Civil War emerges from the lives of everyday people as well as those who helped shape history—John Brown and Frederick Douglass, Lincoln, Jackson, and Lee. His story ends with the valley ravaged, Lincoln's support fragmenting, and Confederate forces massing for a battle at Gettysburg.